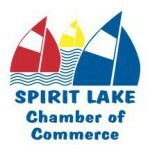 From B&Bs to campgrounds, hotels to resorts, visit the links below for a list of places to stay while visiting Spirit Lake. The Spirit Lake area offers bed-and-breakfast inns that welcome travelers with personalized hospitality and offer a welcome change of pace. For more information, contact the Okoboji Tourism Committee, 243 W. Broadway, Arnolds Park, Iowa 51331, or call 712-332-2209 or 800-270-2574. From locally owned inns to nationally recognized chains, Iowa’s renowned red carpet treatment welcomes guests with comfort, courtesy and convenience. For more information, contact the Okoboji Tourism Committee, 243 W. Broadway, Arnolds Park, Iowa 51331, or call 712-332-2209 or 800-270-2574. Iowa packs its campgrounds and parks with outdoor adventure, natural wonders and memories that last a lifetime. Every season offers new reasons to return! For more information, contact the Okoboji Tourism Committee, 243 W. Broadway, Arnolds Park, Iowa 51331, or call 712-332-2209 or 800-270-2574. Hwy. M49, 12320 240th Ave.